Bailey Holt and Preston Cope, both sophomores, died on January 23, 2018 after police say a fellow student took his step-father’s pistol from a closet at home and opened fire on a group of students before school started. A year after the incident, Kentucky lawmakers have proposed a bill that would encourage local school districts to hire more armed guards and mental health counselors. Survivors of gun violence in west Kentucky led protests against the Friday visit of National Rifle Association leader Oliver North to a Republican rally at Murray State University. Oliver North was invited by the Marshall and Calloway County Republican parties as the featured speaker for their ‘Night Before Fancy Farm’ event. The invitation of North to speak at a local GOP rally sparked an uproar from a community that experienced a deadly school shooting less than seven months ago. North is a retired Marine Lieutenant Colonel and in May was named the next president of the NRA. He is also infamous for his involvement in the Iran-Contra scandal. 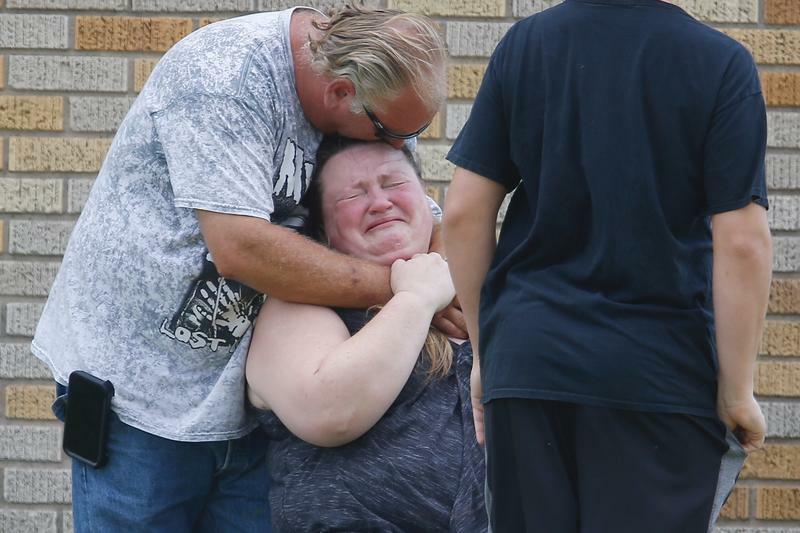 Gun rights and gun violence have dominated national and regional headlines this year, following several shootings, including the deadly shooting last January at Marshall County High School in west Kentucky. Now, as 3-D printed guns could potentially upend the national conversation, and as the president of the National Rifle Association visits the region on Friday, the Paducah/west Kentucky chapter of the nonpartisan group Moms Demand Action for Gun Sense In America is looking to build consensus on gun safety. Christa Dubrock is the group's Local Lead for Paducah. Experts told Kentucky lawmakers that gun violence needs to be addressed as a public health crisis, advising that they consider legislation that would require gun owners to lock up their firearms. A legislative committee heard testimony on Wednesday about how gun violence impacts young people across the state and country. The meeting came after a string of school shootings across the country earlier this year, including an incident at Marshall County High School that killed two 15 year-olds. Gov. Matt Bevin says in order to put an end to school shootings, parents need to stop over-medicating their children and steer them away from cell phones and violent video games. The governor’s comments came during a listening session hosted by the Federal Commission on School Safety, which was created by President Trump earlier this year. Federal education officials will be in Lexington on Tuesday to hear recommendations about how to make schools safer. The listening session will be the second meeting of the Federal Commission on School Safety, which was created by President Trump after the February school shooting in Parkland, Florida, that left 14 people dead. The Parkland shooting took place just weeks after the January shooting at Marshall County High School that killed two. Allen County schools will now have a school resource officer for each of its four schools after the Board of Education decided to hire two additional officers. Previously Allen County schools had two resource officers, who were splitting their time between the schools. Assistant Superintendent of Operations Brian Carter said the district decided to add the new officers because of the recent school shootings at Marshall County High School in western Kentucky and Parkland, Florida. Students from across Kentucky traveled to the state Capitol to rally against gun violence as part of demonstrations that took place across the country on Wednesday. More than 40 students from Marshall County High School made the three-and-a-half hour trip to Frankfort. Marshall County Junior Leighton Solomon was one of several students to speak at the rally. She called on lawmakers to put politics aside and come up with solutions to school violence. In the wake of the January shooting at Marshall County High School, Kentucky lawmakers have advanced a bill that would require schools to employ mental health professionals to recognize symptoms of trauma in students. “But we firmly believe that if implemented, this piece of legislation would certainly spare us tragedy in the future,” Coursey said. A school safety expert told state lawmakers Thursday there’s “no way” arming teachers would make schools safer in the wake of the mass shooting at Marshall County High School. The Kentucky House and Senate Education committees held a special meeting on Thursday to discuss school safety issues, though no specific pieces of legislation were up for a vote. President Trump, Gov. Matt Bevin and some Republican lawmakers in the General Assembly have called for allowing teachers to have access to guns on campus in order to defend students against school shooters.